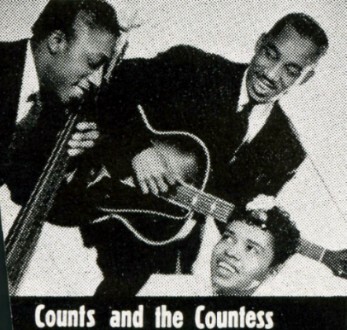 "Ride, Red Ride"/"Rip Up The Joint"
Above: Promotional clipping of The Counts And Countess from the mid-1940's. 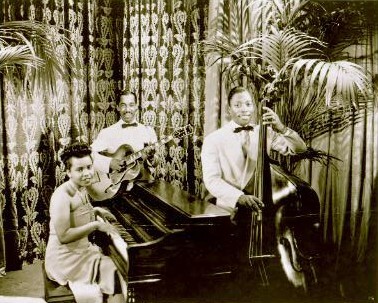 This self-contained vocal/instrumental trio consisted of Alma Smith (piano and vibes), John Faire (guitar) and Curtis Wilder (bass fiddle). Personal Management by Delbridge And Gorrell, 301 Fox Theatre Building, Detroit 1, Michigan. 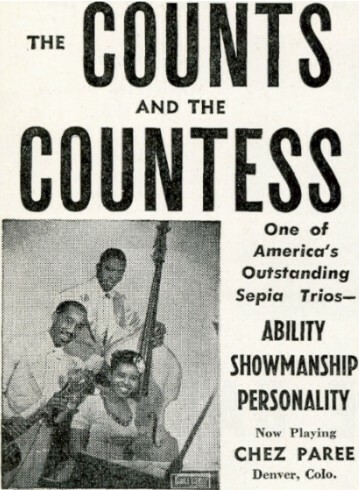 Click HERE for an article about Alma Smith/The Counts And Countess at the History Of Detroit Music Web Site. Above: Label for Melodisc M-105. This side may have won them the distinction of fastest instrument players in the west! The flip is "Rip Up The Joint"... wonder if Little Richard ("Rip It Up") and Bill Haley ("Rock The Joint") were aware of this title. 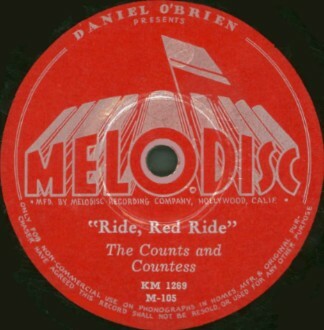 The top of label states "Daniel O'Brien presents"... O'Brien was president of Melodisc Recording Company. A) Click on an option below to listen to The Counts And Countess using Streaming RealAudio. B) Click on an option below to listen to The Counts And Countess using Downloading RealAudio.